U.S. Rep. Al Green, left, meets Jose Escobar and his wife, Rose, at the airport in San Salvador, El Salvador, on Saturday, Feb. 3, 2018, for a meeting that the Houston Democrat hopes will call attention to the plight of deported families. Jose Escobar was deported in March despite not having a criminal record, according to his family. HOUSTON (AP) — U.S. Rep. Al Green still calls Jose Escobar one of his constituents, even though Escobar was deported after what he thought would be a routine check-in with immigration authorities. 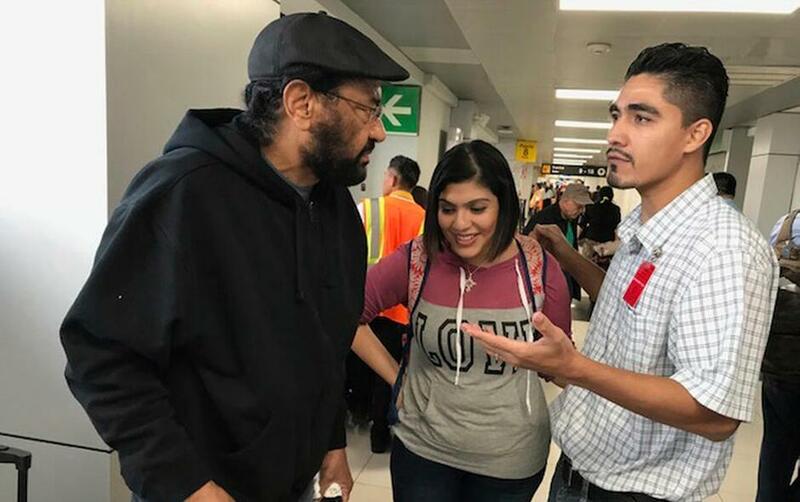 That's why Green, a Houston Democrat, flew to El Salvador on Saturday to meet with Escobar in the hopes it will call attention to the plight of families separated by deportation. Another 200,000 people could be forced to return there because President Donald Trump's administration announced it would end a temporary visa program for Salvadorans. Green and Escobar met in a small room at the airport in San Salvador, El Salvador's capital. They were accompanied by Jose's wife, Rose Escobar, who has remained in Texas with the couple's two children, as well as an off-duty Houston police officer whose airfare was paid for by Green. Green, a fierce critic of Trump who last year introduced articles of impeachment against him, told Escobar he was committed to "doing everything we can to get you back with your family." Speaking to The Associated Press before the trip, Green said he felt obligated to try to help Escobar, who was deported in March despite not having a criminal record, according to his family. Escobar's immigration court appeals have failed, though his attorneys are looking for new ways to petition on his behalf. "If not for his place of birth, we would call him an American citizen who is all of the right things," Green said. "This is the kind of citizen that we would admire." El Salvador is one of the most dangerous countries in North America, an impoverished nation of 6.4 million people with one of the highest homicide rates in the world. The State Department warns people against visiting due to the country's rampant murders, rapes and other violent crimes. The meeting took place in the same airport where Escobar called his wife last March to tell her he had been deported. Escobar's family settled in the U.S. in 2001 with temporary protected status, which was granted to Salvadorans who were victims of earthquakes that year. The program for El Salvador was extended by two presidential administrations, but the Trump administration announced in January that it would end it in September 2019, saying the problems that made temporary visas necessary no longer existed. Escobar, 32, settled in Houston at the age of 15. Only around the time he married his wife in 2006 did they realize he was in the U.S. illegally because his family hadn't received the paperwork necessary for him to renew his visa. An immigration judge ordered his deportation in 2006, and he was arrested in 2011 and detained for several months. After an intense lobbying campaign, ICE's Houston field office director released Escobar in January 2012. Shortly after taking office in January 2017, Trump signed an executive order widening the categories of immigrants without legal status who could be subject to deportation. Escobar went to an ICE office the next month to check in under the terms of his order and was detained until his March deportation, his wife said. ICE confirmed in a statement that it deported Escobar and that his release in 2012 was so "he could get his affairs in order prior to his removal." Escobar now lives with relatives in a town that's about a three-hour drive from San Salvador. He worries about the gang members who control the streets and often accost people who have recently returned from the U.S.
Before the meeting, Rose Escobar talked about how their children were learning to cope. She said their 3-year-old daughter, Carmen, stopped speaking for several weeks after Jose was deported, which a doctor told her could have been caused by the trauma of the deportation. Their 8-year-old son, Walter, has slowly come to understand what happened. But shortly after Hurricane Harvey in August, she got a call from the school saying that he had broken down crying. The teacher who consoled him was herself protected by Deferred Action for Childhood Arrivals, a program shielding young immigrants from deportation that the Trump administration has planned to end in March. Rose said she worries about Jose, who the rest of the family calls before dinner every night and before the children go to bed. In Texas, Jose had worked his way from being a painter on a construction crew to a crew supervisor. He wore a suit and did most of his work on a laptop, which he brought with him to the check-in last February. Now, he works as a laborer whenever a job is available, often lifting heavy stones and putting them into place for houses and buildings. He stays in his room most of the time. "All of your sacrifices that you make for so many years, you see them taken away from you," he said Saturday. "After deportation, all of that is gone." Rose Escobar is a hospital receptionist and relies on savings that are slowly dwindling. She questions whether anyone who has spent years in the United States could handle returning to El Salvador. "For someone in Jose's case, can they adjust over there?" Rose said. "No. It's almost been a year, and he's still in his room, and it breaks my heart."